A liquid when cooled solidifies. Alternatively, it may solidify when the pressure is decreased or increased, depending on the sign of the density change. Once nucleation has occurred, solidification proceeds by the movement of an interface. The process may generate heat if the enthalpy of the solid is less than that of the liquid. Similarly, solute may partition into the liquid if its solubility in the solid is less than that in the liquid. Computer simulated image of dendritic growth using a cellular automata technique. Notice the branching on the dendrites. Photograph courtesy of the Institute of Materials, based on the work of U. Dilthey, V. Pavlik and T. Reichel, Mathematical Modelling of Weld Phenomena III, eds H. Cerjak and H. Bhadeshia, Institute of Materials, 1997. 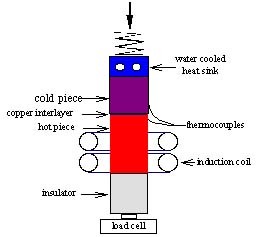 The accumulation of solute and heat ahead of the interface can lead to circumstances in which the liquid in front of the solidification front is supercooled. The interface thus becomes unstable and in appropriate circumstances solidification becomes dendritic. The mechanism of this instability is discussed elsewhere. A dendrite tends to branch because the interface instability applies at all points along its growth front. The branching gives it a tree-like character which is the orgin of the term dendrite. Computer simulated image of the dendritic solidification of pure nickel. The simulation is of "free growth", i.e., the solid is growing without contact with anything but the liquid. The degree of undercooling of the liquid in front of the interface is indicated by the adjacent scale. 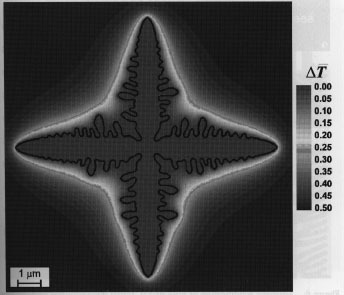 Photograph courtesy of the Institute of Materials, based on the work of U. Dilthey, V. Pavlik and T. Reichel, Mathematical Modelling of Weld Phenomena III, Institute of Materials, 1997. Growth tends to occur along fast growth directions which are generally <100> for cubic metals. We first consider the solidification of a "hardfacing alloy" which is deposited as liquid on substrates which require wear resistance. Typical applications include earth moving equipment, heavy farm equipment and rock crushers used in the mining industry. The alloy has a chemical composition Fe-34Cr5Nb-4.5C wt.%. During cooling, niobium carbide dendrites are the first to solidify. Their shape can be revealed by attacking the sample with an acid which removes the matrix iron-rich phase Figure. In this particular case, the solid/liquid interfacial energy is varies with orientation so the minimum energy shape is that with crystallographic facets. The fast growth direction is still <100> as can be deduced from the symmetry of the dendrite. 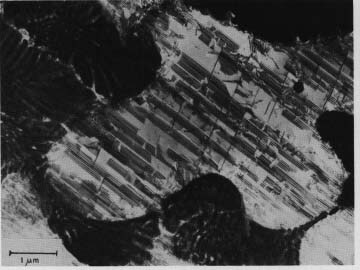 Scanning electron micrograph of a niobium carbide (cubic-F) dendrite in an iron-base hardfacing alloy. Photograph by courtesy of Berit Gretoft, Central Research Laboratories, ESAB AB, Sweden. 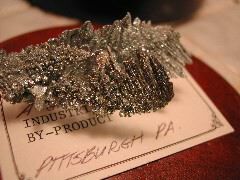 The second example deals with a cobalt-base alloy known as "Stellite". This is much more expensive than the iron-base alloy described above but is considerably tougher because it has a much finer microstructure. Thus, it is necessary to use transmission electron microscopy to study the fine structure Figure. 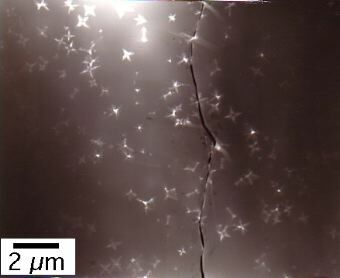 Dendritic solidification frequently occurs under conditions which are far from equilibrium. Given these circumstances, regions of solute-rich liquid can be trapped between the dendrite arms, and solidify eventually to solute-rich solid regions. This in turn leads to the development of a "banded" microstructure when the material is subsequently processed by rolling or other mechanical fabrication methods. The banded microstructure Figure can be detrimental to the mechanical properties. 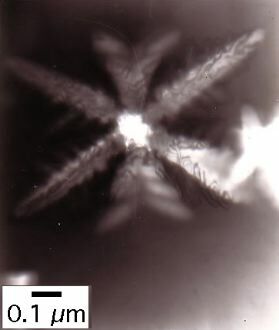 The following photographs show dendrites of zinc obtained by withdrawing the solid from a melt of impure zinc. 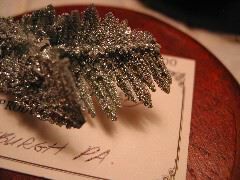 The photographs are of samples collected by Professor Paul Howell, Pennsylvania State University. 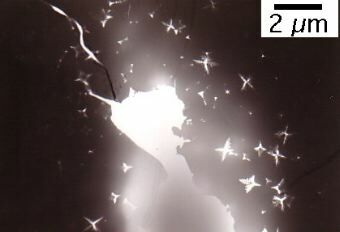 Dendrites of zinc rescued from partially solidified melt. When the weather outside is cold, moisture in a warm room can condense on the inner surface to form a thin film of moisture. 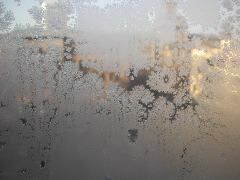 If the temperature outside is sufficiently low, ice nucleates and grows. 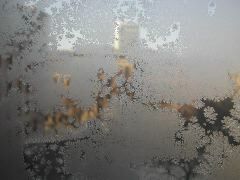 The region around the ice crystal becomes depleted in moisture. Moisture then has to arrive to the ice crystal by diffusion through the depleted zone, from the remaining moisture far from the interface. Suppose a small part of the ice crystal accidentally advances further then the rest of the interface. The diffusion distance for that perturbation decreases, and hence the perturbation grows faster. This leads to the formation of a branch, and a branching instability is said to have formed. 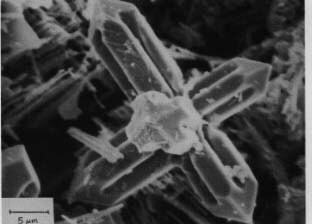 This leads to the formation of ice dendrites as illustrated below. 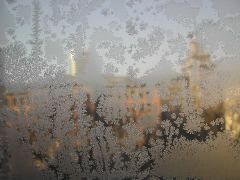 These pictures were taken at the Harbin Institute of Technology - the temperature outside can be below -20oC. 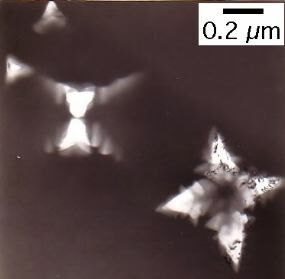 The mechanism described here is essentially how snow-flakes are supposed to form, by the diffusion of water molecules through air on to the ice crystals. Snow-flakes have the dendritic morphology in three dimensions. When a sheet of ice undergoes internal melting, dendrites of water form inside the ice. It is now the liquid which advances into the solid with an unstable interface. 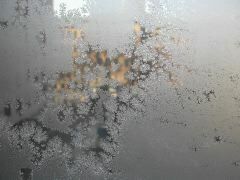 Furthermore, since ice has a lower density than water, a bubble forms inside each dendrite of the water. The following transmission electron micrographs have kindly been provided by Andrew Fairbank with copyright clearance from the University of Wollongong. 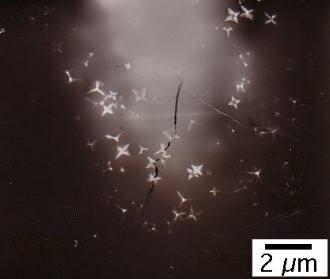 They show the early stages of dendrites of α-(Fe,Si) growing in the solid-state, from the amorphous Fe82Si4B14 metallic glass during annealing at 433 °C for 60 min. Dendrites forming in Fe82Si4B14 metallic glass. Some materials cannot be welded by conventional techniques because the high temperatures involved would destroy their properties. For such materials, diffusion bonding is an attractive solution because it is a solid state joining technique, which is normally carried out at a temperature much lower than the melting point of the material. Diffusion bonding is a candidate process for joining many aluminium based materials including a variety of artificial composites. Unfortunately, the method has been beset by difficulties, particularly that the bond line remains a plane of weakness. This is because the bond plane is a site for impurity segregation, where oxide particles may also be trapped. In addition, there can be problems in ensuring the continuity of the metallic bond. Shirzadi and Wallach (Materials Science and Metallurgy, University of Cambridge) invented a disarmingly simple method of breaking up the planar bond into an unstable interface which develops into a three-dimensionally 'sinusoidal' or cellular surface. A small temperature gradient was applied at the bond, causing the interface instability. This concept is taught in many undergraduate courses but it took imagination and foresight on the part of Shirzadi and Wallach to apply it to transient liquid phase bonding. The method is incredibly successful, leading to a vast increase in bond strength, and has been granted a UK patent, No. 9709167.2, the Granjon Prize of the International Institute of Welding and the Cook-Ablett Award of the Institute of Materials. Some discussion of the transformations illustrated in these movies can be found in Metals and Alloys lectures. 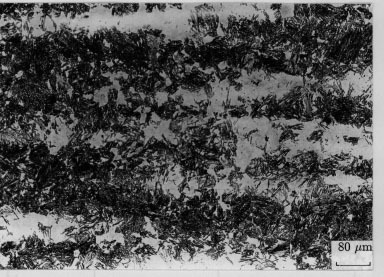 Solidification to a dendritic microstructure where the primary phase to solidify is delta-ferrite, in Fe-0.15 wt% C. velocity 0.1 mm/s, temperature gradient 15 K/mm. The dendrites in this simulation are constrained to grow along particular crystallographic directions determined at the nucleation stage. This is why they grow at an angle even though the temperature gradient is vertical. 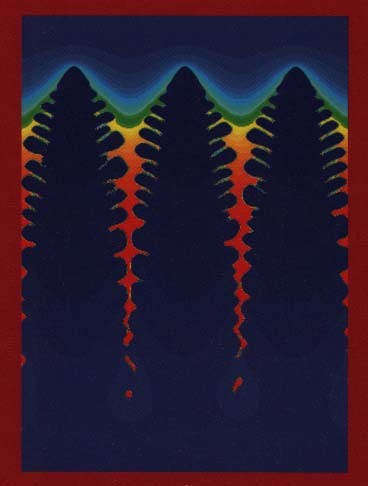 The simulation illustrates selection during growth, i.e., dendrites which are better oriented to the temperature gradient overgrow those which are not well oriented. This movie has been provided by courtesy of Janin Taiden of Access in Germany. The following movie is a simulation of eutectic solidification in an Al--Si system. It has been provided by courtesy of Britta Nestler of RWTH in Aachen, Germany. The simulation is based on a technique known as "phase field" modelling. In this method, the boundary is treated as a continuous transition between adjacent grains across a thin layer of finite thickness. The value of a phase-field variable then identifies the location of the boundary and of each grain. The advantage of this method is that the boundary becomes a part of the system so that it does not have to be determined explicitly in the solution. Notice how the eutectic spacing changes as solidification proceeds, and the nature of the solute diffusion field at the solidification front. The diffusion distance is not very large, about equal to the spacing of the lamellae. The simulations presented here have been provided for teaching purposes via the good offices of Dr Vitali Pavlik of Aachen University in Germany. Movies about dendritic and cellular solidification. Professor Clare Grey and her team at Cambridge University have concluded that metal fibres in the form of dendrites grow within lithium batteries which are charged rapidly. These cause short circuits, overheating and in some cases, fires.